The gigantic white creature is a bone colossus (AC 0, MV 12", HD 10, hp 45, #AT 1, D 4-14, regenerate 3 hp per round, immune to cold, sleep, charm, and hold spells, edged weapons do half damage), a being created from the joining of many skeletons. 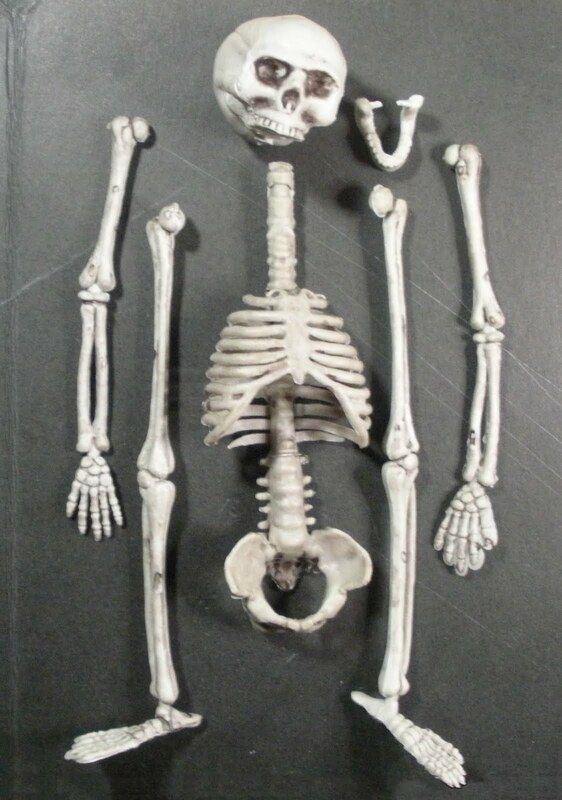 At closer inspection, many different types of bones may be seen jutting from the body. In one hand it holds a bone club. Total dismemberment will not destroy the colossus; the bones that form it will move back together and rejoin, creating it anew. Fire and acid damage are permanent. Once the colossus is reduced to 0 hit points, 10 rounds (1 turn) will be required before the creature is reformed. A cleric may turn the creature as if it were a "special" class of undead." Gashadokuro (がしゃどくろ)/Odokuro (大髑髏) appears as a giant skeleton that can be more than fifteen times the height of an average person. It is typically described as a malevolent spirit that is created from the fused bones of people who have died of starvation. 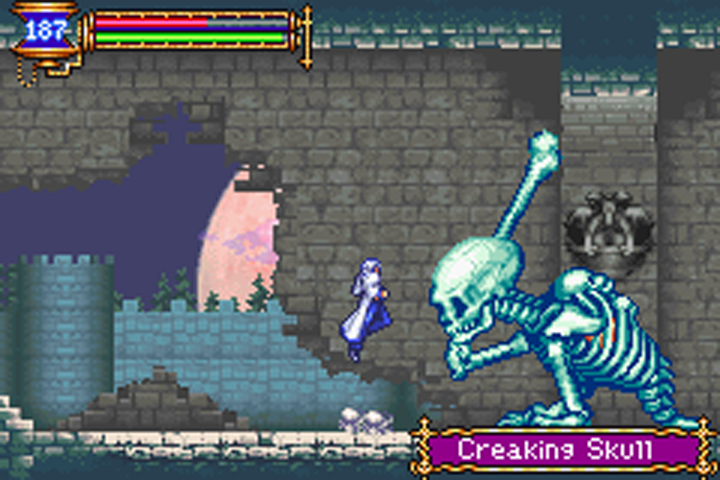 Other sources say that Gashadokuro can form anywhere there are large collections of unattended corpses. Gashadokuro roams the countryside after midnight searching for victims. It's favorite method of attack is to grab a victim and bite off his head (and incorporate the skull into its body). Apparently some of the less wasteful Gashadokuro will strip the flesh from the bones of the victim's body and absorb those as well. Despite its fearsome nature, Gashadokuro can be easily avoided by those who are alert, because its approach can be sensed by people as a ringing in the ears. 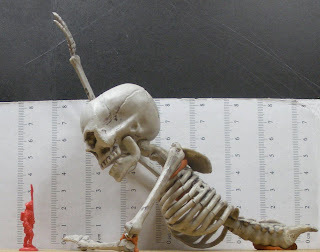 Being October, there are a number of sources for Halloween decorations that can be converted into Gashadokuro. I picked up my skeletons at Michaels for under $2 each (after coupon discount). 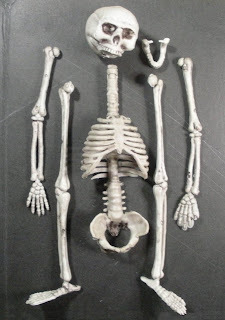 The skeleton has a bit of flash on it, and suffers from a lack of scapulae and clavicles. The mandible is a separate piece that is attached to the skull by a couple of pegs to allow movement. 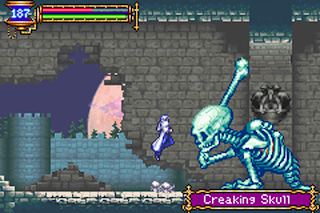 When the whole skeleton is depicted, Gashadokuro is often shown in a stooping, crouching, or crawling position, presumably to be closer to its victims. 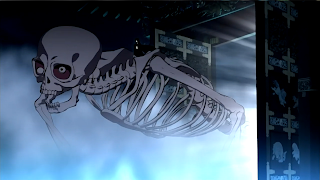 Most of the time however, Gashadokuro is depicted as a half skeleton. For my first conversion, I decided to model Gashadokuro after the Creaking Skull from Castlevania. I clipped the pelvic girdle from the skeleton, and used a heat gun to bend the lumbar and cervical regions to the positions that I needed for the Creaking Skull. I overdid the heat a little, so lost some detail at the neck, which I will have to restore later with epoxy. I cut a hole in the underside of the skull so that it would fit on the spine, and repurposed the illiac bones as scapulae. I used some Elmer's Tack to hold the skeleton together for the picture, but haven't figured out how to attach all the bones together yet. I'm thinking of using a combination of wire and epoxy, but am not altogether ruling out the use of some magnets in certain strategic locations. Thanks for the link Col. I'm jealous that you can get 5 skeletons for 99p though.